Earth moving equipment at work at the Big Cypress Bend Boardwalk area. Work has started on the deceleration lane opposite the new parking area entrance at Fakahatchee’s Big Cypress Bend Boardwalk. This construction demonstrates that the Friends of Fakahatchee Boardwalk Improvement Project is underway! Completion of the lane is expected by the end of March. Construction of the new Big Cypress Bend Boardwalk entrance, parking area, bridge over the canal and the new low-level boardwalk linking the old site (phase 1 of the project) is being undertaken separately by the of the Department of Environmental Protection’s Bureau of Design and Construction later this season. 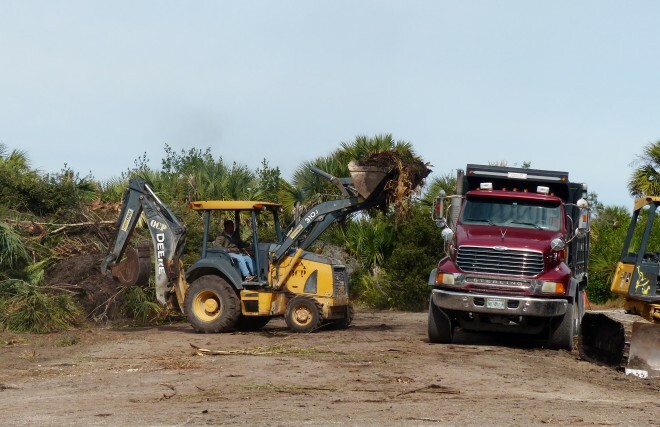 The road construction is an exciting start and shows that the Friend’s of Fakahatchee’s multi-year effort to improve the site is finally bearing fruit. For details on the project, click on The Boardwalk under the Plan Your Visit tab above.